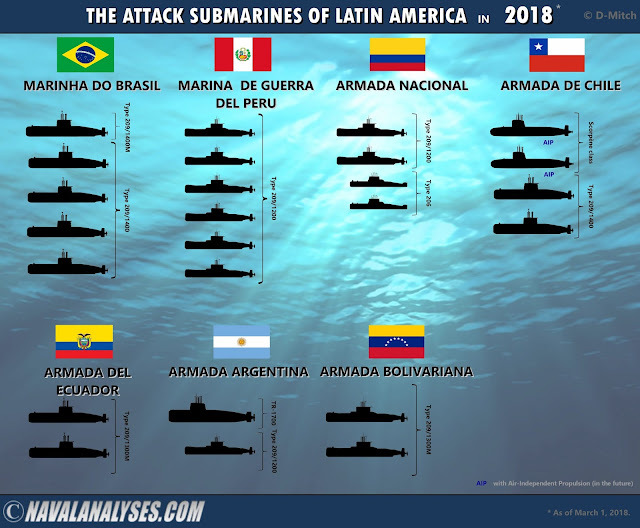 In the following infographic, named The Attack Submarines of Latin America in 2018, I depict all the attack submarines that are in active service in Latin America right now (and will continue to be part of their Navies until the end of 2018). Please note that in comparison with the previous graph about The Attack Submarines of Europe in 2017 (updated for 2018), there is no nuclear-powered submarine (SSN) in any Navy (at least until Brazil commissions its first vessel after 2020), neither there is a submarine equipped with Air-Independent Propulsion (AIP) system (the Chilean Scoprene class submarines are fitted but not with the system and will receive it in a future refit). It should be mentioned also that from the 21 countries of Latin America, only seven navies (7) have submarines in their fleet; Peru has the most numerous fleet but Brazil and Chile the most modern submarine fleets in the region. Moreover, the 92% of the Latin American submarines are German-built (!). 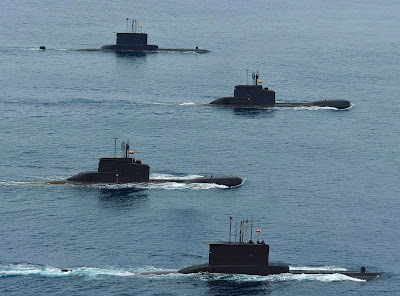 Also, Argentina, while it has in its inventory the largest submarine in the region (TR1700 class: 67 meters length and 2,100t displacement), none of its submarines is in active service. The Attack Submarines of Latin America in 2018. For a high resolution image click here.